Well, not that far from the edge, but enough that there is no traffic and I can listen to the cows softly talk amongst themselves and smell the sweet scent of hay in the air. Under the shelter of a buffalo jump, I can view the Rockies from the front porch and if I am so inclined, and I am every day, to climb the buffalo jump, I can gaze upon the majestic peaks of the ranges of Gallatin and Tobacco Roots. The front range is the beloved Bridgers where I have had the pleasure to wander lost in thought. The purpose of this site is to step away from my hectic days of Blue Morning Expressions and set up my humble portfolio of past writings and the wandering camera lens as I have traveled about the continental United States. There is much to see in this great land and much to write stories about. 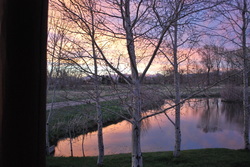 As you can see from my photo, there is purple mountain majesty that surrounds my days and the pretty pond is a soothing site when I am wrestling with a design or a word. Please wander about and visit. I will be on the front porch with my feet up and a glass of lemonade in one hand.